In my last post I presented an exciting new approach to treating cancer and viral infections called Adoptive Cell Therapy. The technique employs engineered transmembrane proteins known as Chimeric Antigen Receptors (CAR) to direct the serial killing action of cytotoxic T cells (T lymphocytes). However, the selection of the target to which it homes is of considerable importance. The process of tuning cytotoxic T lymphocytes (CTL) to kill cancer cells is undoubtedly a spectacular innovation but it can be precarious. The primary function of a CTL is to bind and kill any cell found bearing the ligand of the CTL’s antigen receptor (the CAR in this case) on its membrane. There are many factors that must be addressed when tailoring the therapy to treat a given pathology; the most significant of which is selecting the CAR’s ligand (its target). Other factors include how many CAR+ T cells should be injected and how to control their proliferation and longevity after injection. After completing the reading that went into this post I am not certain that, one, erbB-2 is a suitable CAR target, and two, I have been convinced that the use of chemotherapy as a neoadjuvant (administered just prior) to any targeted molecular therapy should be questioned. In stark contrast to the years of safe administration and the cancer clearing success stories of late; recently there were two deaths in CAR based clinical trials. The case I’d like to focus on is one in which an on-target/off-tissue event appears to be the cause of death (1). The Cytotoxic T Lymphocyte action was on-target in that its CAR bound to the proper ligand, erbB-2; however it was off-tissue in that the ligand was expressed on normal cells in healthy tissue. My first thought was that a poor choice was made in target selection. The CAR transfected into this person’s T cells had specificity for the extracellular domain of transmembrane receptor erbB-2 which is now commonly known as Human Epidermal growth factor Receptor 2 (HER2). However, given the fact that the CAR was built using the monoclonal antibody (mAb) Trastuzumab (Herceptin) (1) which has a stellar record of safety and efficacy, it seemed I was wrong. ErbB-2 belongs to the ErbB family of transmembrane receptors now referred to as the Epidermal Growth Factor (EGF) receptor family which has four members. The signals generated by these receptors regulate cell proliferation, differentiation, and survival in mammalian cells (2). As their name implies they can be found in cells all over the body. Upon learning this I had two questions. First, was erbB-2 expressed in any healthy adult tissue? Perhaps it is only the other three family members that are expressed in normal cells and erbB-2 in certain types of malignant cells. And second, if it is expressed on normal cells, what is the level of its expression (how much in a given cell)? * On a side note, during the search I found that the level of expression of erbB-2 may be the key to growth of the malignant tissue in which its found. Although it is an orphan receptor in that it does not bind any known ligand, if the expression level is high enough, it can form homodimers and produce growth and proliferation signals without one (1); thus its high oncogenic potential. An immunohistochemical analysis (using antibodies to label a specific protein within a cell) in 1990 revealed that ErbB-2 was expressed in adult human epithelial cells “in the gastro-intestinal, respiratory, reproductive, and urinary tract as well as in the skin, breast and placenta.” (3) I also learned that erbB-2 serves as a critical signaling partner to the other erbB family members and also plays a major role in normal cardiac development (4). In the paper presenting the women’s death, the proposed cause of death was the binding of the CTL to erbB-2 expressed on healthy lung tissue which I think is consistent with the findings of the immunohistochemical analysis. The SAE report concluded with the postulate that the woman’s death was cytokine-induced pulmonary toxicity and edema which lead to cytokine storm (essentially a massive cell-signal feedback loop) and subsequent multiple organ failure. This led me to believe I may not have been wrong after all; maybe erbB-2 is safe for mAb-based therapies, but not CAR\CTL. However, the researchers speculated that it was cytokine release, what I thought was a secondary CTL function, as the cause not the CTL’s primary effector function, cell killing. I will have to explore why that is. I had some difficulty sifting through the papers and data to determine the levels of expression in those normal adult endothelial cells; some sets even presented conflicting data. This is due in part to the fact that I’m not independently wealthy and the cost of access to most research papers is high. Other major factors include the fact that it turns out that there are multiple splice variations (isotypes) of erbB-2. However, I did find some information on the function, structure, and expression patterns in two great papers. From the first I learned about the structure and function of the erbB family of receptors and the a family of ligands, Neuregulin (NRG), whose Epidermal Growth Factor domains bind to erbB receptors. This paper, which also presented a summary of the NRG/erbB signaling pathway, was written by Nadia Hedhli and Kelly Russell (4). The second, from M F Press, et al, was the only paper I found which described, in depth, the expression levels of erbB-2 and offered a safety rationale for using it as a therapeutic target. The quantitative analysis went so far as to suggest a threshold for erbB-2 receptor sites per cell under which a mAb, combined with a payload that must be endocytosed, would be effective. The safety rationale stated that since within normal, adult, endothelial cell membranes there are less than the threshold, 500k sites/cell, using the erbB-2 mAb would be safe and, given that the number is higher malignant cells, effective (3). While I found the evidence presented by M F Pass et al. compelling, they were delivering a ribosomal inhibitor that required endocytosis and migration to specific areas within the cell in sufficient quantities to be effective. The sites/cell threshold, it seems to me then, must be significantly lower when it comes to the use of cytotoxic T lymphocytes. My search to answer the questions of erbB-2 expression distribution and levels has yielded information that seems to fit the facts. Significant cardio and pulmonary pathologies after treatment with Trastuzumab and one fatality shortly after receiving a transfusion of CTLs containing an erbB-2 tuned CAR. In fact, the NIH drug information page for Herceptin (Trastuzumab) lists serious cardio and pulmonary, along with “swelling of the arms, hands, feet, ankles or lower legs; weight gain (more than 5 lbs in 24 hours); dizziness; loss of consciousness”, in the list of side effects. However, Trastuzumab is a great success and among those treated serious adverse effects were only reported in a minority of cases. For example, Medscape reported in 2011 that only 1-4% of patients experienced severe cardio toxicity (Herceptin as adjuvant to chemo). So the next question for me is why, given the seemingly common expression of erbB-2 would the percentage be so low. Could the methods used to perform the immunohistochemical analysis caused its expression? I will read further to investigate despite the fact that it will probably only amount to an intellectual given that there a number of far larger brains than mine already looking in to it. When I combined what I found so far with the report that an increase in expression of ErbB-2 is linked to protective mechanisms in Hedhli and Russell’s paper, I began to question the use of chemo and radiation as a neoadjuvant treatment to erbB-2-targeted CAR and even Trastuzumab regimens. It seemed telling, given erbB-2’s role in development which I think would follow injury, not just embryogenesis, that while Trastuzumab’s efficacy has repeatedly been shown to increase with chemo as a neoadjuvant so, apparently, is the occurrence of toxicity (4). As an example, it has been shown that activation of erbB-2 and -4 promotes the growth and survival of cardiac myocytes (cells that control heart rate) (4). Anthracycline has been shown to induce apoptosis in cardiomyocytes and the function of the erbB family with its ligand Neuregulin (NRG) has been shown to protect those myocytes (5). Further, when tissue containing endothelial cells is excised for culture and those cells are examined, erbB-2 expression is up-regulated. The reason has not been determined (1), however, given erbB-2’s established signal functions and its essential role in cardiac development, is it unreasonable to conclude that the tissue damage unavoidable in the process of excision may have induced the pathway leading to erbB-2 expression. Could the tumor, chemo, and/or radiation sourced destruction in healthy tissue result in increased expression of erbB-2? And does this up-regulation contribute to the cardio and or pulmonary toxicity seen in Trastuzumab administration? The mechanism of action for Trastuzumab and mAb\cytotoxin-based treatments may allow for the leeway necessary for such successful treatment history. The efficiency of action of cytotoxic T lymphocytes may not. In the end, erbB-2 is a “self” antigen. If not always, at least at certain times or under certain conditions, the receptor is expressed and functions in normal cells. This in itself doesn’t render it a questionable choice. CD19 is a self-antigen expressed on early B cells and when it was targeted in a CAR treatment, the chemorefractory patients exhibited a complete response; cancer free six months out. These patients’ healthy B cells were also targeted, however, given that lymphocytes are regenerated and that they do not form a critical structure in the body, they can be targeted with relative safety; chemo, for example kills which much less discretion. The same cannot be said with certainty, in my opinion, of erbB-2. 1. Case Report of a Serious Adverse Event Following the Administration of T Cells Transduced With a Chimeric Antigen Receptor Recognizing ErbB2. Morgan, Richard A, et al., et al. 4, 2010, The American Society of Gene & Cell Therapy, Vol. 18, pp. 843–851. 2. A comprehensive pathway map of epidermal growth factor receptor signaling. Oda, Kanae, et al., et al. 2005, 2005, Molecular Systems Biology. 3. Expression of the HER-2/neu proto-oncogene in normal human adult and fetal tissues. Press, M F, Cordon-Cardo, C and Stamon, D J. 7, 1990, Oncogene, Vol. 5, pp. 953-62. 4. Cytostatic Drugs, Neuregulin Activation of ErbB Receptors, and Angiogenesis. Hedhli, Nadia and Russell, Kelly Strong. 2010, Current Hypertension Reports, pp. 411-417. 5. Neuregulin-1 protects ventricular myocytes from anthracycline-induced apoptosis via erbB4-dependent activation of PI3-kinase/Akt. Fukazawa, Ryuji , et al., et al. 12, 2003, Journal of Molecular and Cellular Cardiology, Vol. 35, pp. 1473-1479. 6. Safer CARS. Heslop, Helen E. 4, s.l. : Nature, 2010, Molecular Therapy, Vol. 18, pp. 661–662. Imagine a person with Stage IV Chronic Lymphocytic Leukemia, a cancer of the white blood cells. A scan of his bone marrow shows almost complete replacement of healthy cells with cancerous. The cancer is chemorefractory, meaning it survives every dose even while his normal rapidly dividing cells do not. Now, instead of the normal treatment progression and a poor prognosis, some healthy T cells are extracted from his blood. They are processed, induced to replicate, and then the large resulting colony of cells is infused back into his blood. Thirty days later, a scan reveals his bone marrow to be clear of the cancer and another 6 months later shows the same; a complete resolution to the cancer. While I asked you to imagine, you actually don’t have to; the process, the person, and the results are real; part of a clinical trial which is still actively recruiting patients. It is not complete and the information presented in the NIH webcast, which was my original reference for this post, has not been audited let alone published1. The same however, was not the case in all CAR trials, two courses in others, resulting instead, sadly, in fatalities2. However, as I will present in my next post, the protocol was changed for the second group and there were special circumstances. (* See Note: I am not a physician, I am self-taught in the bio-sciences). This new approach to cancer treatment, which includes the specific therapy that killed this man’s cancer, is known as Adoptive Cell Therapy. Specifically in this case, engineered genes coding for what is known as a Chimeric Antigen Receptor (CAR) were introduced into the T cells extracted from his blood via a retro-viral vector. I wrote about Antigen Receptors over my last four posts and the word Chimeric in the world of molecular biology refers to the fact that the gene is actually a combination of other genes or gene segments brought together from different sources. You may note that the concerns from previous attempts at using retroviruses are mitigated here because the transfection actually occurs, effectively, in a petri dish rather than in the body of the patient. Further, using a cytotoxic T cell is preferable to say antibody treatment since rather than relying on an orchestrated immune response to the antibody binding of its ligand to kill a target cell; cytotoxic T cells kill directly and serially. There are essentially three steps in the engineering of a gene which encodes the CAR. The first is to identify a molecule, the new receptor’s ligand, that exists on the surface of the cells that are to be destroyed. The second is to find a molecule that has binding specificity for that ligand, perhaps a variable region from an antibody or the extracellular region of a co-stimulatory receptor. For example Herceptin is a monoclonal antibody used in the treatment of breast and other cancers. It has binding specificity for erbB2 which is highly expressed on the surface of malignant cells. Another example comes from the fact that the CD8 receptor found on T Cells happens to bind with high affinity to the glycoprotein GP120 which is present on the envelope of HIV. If an antibody is chosen, segments of the genes that encode the variable regions of the heavy and light chains (see previous posts) are linked together from the 3’ end of the light chain to the 5’ end of the heavy (note that DNA molecules are formed in one direction 5’ to 3’)3. This produces a gene which encodes a single protein designated scFab or Single Chain Antigen Binding Fragment. The next step is to find a suitable signal generation protein chain for the intracellular domain of the chimeric receptor. This step is far simpler than the first two given that it appears that there a relatively small number which can initiate T cell effector programs such as cytotoxicity. Second generation CARs, for example, used the zeta ( ζ) chain of the T Cell Receptor Complex joined to the scFab via the transmembrane region of a co-stimulatory molecule such as CD 8 or CD282. Third generation CARs use the intracellular signaling domains from 4-1 bb or OX402. I haven’t read of the reasoning for the change, but my thoughts are that it stems from the fact that 4=1 bb and OX40 are present only on T cells which are already activated. The ζ chain, on the other hand is involved in the initial activation of a T cell. Therefore the results of the signaling through 4-1 bb and OX40 would be more specific to cytotoxic effector function rather than the proliferative and cytokine release functions that are part of the in the initial activation of a T cell. This means that there wouldn’t be cascading bursts of T cell proliferation and cytokine production following each encounter with the CAR and it’s antigen thus lessening the potential for a massive expansion of the T cell population after injection and adverse reactions to very large releases of cytokines. To illustrate the need for a signaling region, consider the ζ chain. The T and B Cell Antigen Receptors, whose formation I presented in my previous four posts, are key to the function of our adaptive immune response. However, they are not present in the membrane alone and they are not actually capable of producing an intracellular signal. Though I didn’t mention the other proteins in my posts, the Antigen Receptors are actually part of a complex which includes other proteins in close association which are capable because they contain ITAMs. 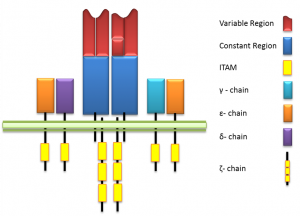 The ITAMs; Immunoreceptor Tyrosine-based Activation Moieties, are initiators of stimulatory signals and are activated when the Antigen Receptor binds its ligand. In a T cell these proteins are collectively known as CD3 and together with the Antigen Receptor; the T Cell Receptor Complex. Returning to our hero and the generation of the Chimeric Antigen Receptors that killed his cancer… In the lab (in vitro), the proliferation of his T Cells was induced, amazingly, using beads engineered to mimic the activity of dendritic cells which are the most proficient presenters of antigen to T cells in the body (in vivo). Then the genes encoding the third generation CAR are delivered to those cells, via a retrovirus. His T cells are subjected to a battery of quality tests and then cryogenically frozen until he was ready to receive them. The scFab region of this CAR has binding affinity for a molecule (the receptor’s “ligand”) expressed on the surface of the malignant cells known as CD19. When the millions of his T Cells, rendered cytotoxic and specialized through synthetic bioengineering, were injected into his blood, the cancer was gone within 30 days. Despite this astounding result, and the result of others in the trial, the work, is still far from complete. CD19 may be expressed on his malignant cells, but those cells were B cells, and CD19 is expressed on virtually all B Cells. So at 6 months, while his bone marrow was clear of the malignant cells, it was also clear of any B cells. While this was actually a big step to the positive given immunosuppressive chemo isn’t usually so selective, an “on-target but off-organ” effect has been seen in this and other studies2. This occurs when the target of the anitgen targeted by the T cells is expressed on healthy cells not intended as targets. In the case of CD19, this is less an issue because the Immune System is regenerative and its function is specific. However, if the target is expressed on the cells of healthy tissue to a high enough degree, the results can be devistating. The people included in the trail, as I interpret the information, had a very poor prognosis with advanced, chemorefractory cancers. The two fatalities in another CAR trial involved several differentiating factors, but the exact cause of death was presented as inderterminate. In one case there was the possibility of an unrelated infection as the cause, but in the other “on-target, off-organ” seemed likely. I will present more information on this as well as the “on-target but off-organ” effect in my next post. * Note: I’m not a researcher nor a clinician, and nothing I present in this post, or any other post I may make on a health science topic, should in any way be considered medical advice, the intent of the authors of any of the texts or research I reference, or an authoritative presentation on any source used. This post is solely my understanding along with, perhaps, my ideas based on my understanding of the material I’ve read.